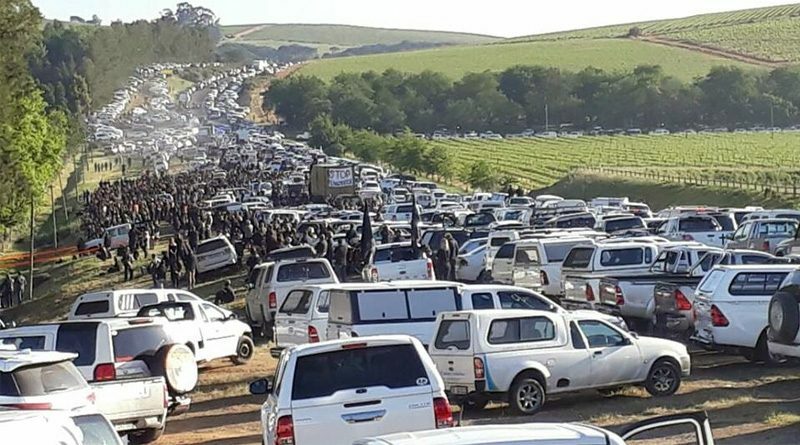 Afrikaners are protesting the wide-scale murder of Whites (especially White farmers, called Boers) in South Africa today by blocking major highways. The BBC reports that members of the country’s Black government are labeling the action “racist” because some of the protesters are flying the old national flag. That flag harkens back to a time when South African farmers lived in safety; when the country’s cities were clean and safe; when White unemployment was non-existent; when the beaches were clean and beautiful; when South Africa was a First World country of opportunity rather than a place to escape. The BBC’s Pumza Fihlani in Johannesburg says the protests are already causing racial divisions after some demonstrators were seen carrying the flag from the apartheid era, when South Africa was governed by its white minority and black people were not allowed to vote. …The protest was organised to show outrage at the killings of farmers, especially after the death of a white farmer in Klapmuts near Stellenbosch. Last Tuesday, Joubert Conradie, 47, was shot on his farm and died later at the Stellenbosch Mediclinic. The idea that white farmers are being targeted has been going around for some time. The fact-checking site Africa Check found back in 2013that white people in South Africa are less likely to be murdered than any other racial group. The spokesman for the priority crime police unit, known as the Hawks, Brigadier Hangwani Mlaudzi told the BBC’s Milton Nkosi that the police did not keep specific statistics about farm killings. “Cases are not classified as farm murders. They form part of all murders under investigation,” he said. Click here for an excellent South African Facebook profile with lots of information and pictures of the protest and the plight of the Afrikaner people. Brad/Hunter, if your articles are true; then why do you write under an alias?! You’re not afraid of getting sued or arrested for slander/libel, are you? This isn’t Brad/Hunter. The articles are attributed to the sources. If there are any complaints the email works both ways.